working on a QP website.. Comments on working on a QP website..
Been meaning to do this for a while but just now getting around to it.. 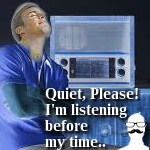 I'm building a Quiet Please website - no forums or anything like that, just a dedication site that will also try to promote getting 25 potential buyers for the restoration attempt Radio Archives, and also direct people here at quietplease.org. It's not done, and most links haven't been incorporated yet, and the design is still in need-- but right now my main concern is that the information presented on the main page is accurate, which I took some time to write.. and also in my log. Looks really good! Interesting design and tons of info. Odd seeing Cooper in color. Let me know when it's done so I can add it to the links page. Hey Paul, the site is probably as finished as it will ever be. I haven't done anything to it in well over a year, but it's pretty complete I think.. So a link to it would be appropriate. Great work, I've added it.